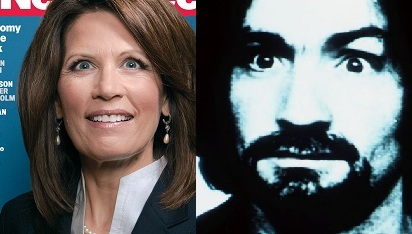 Does The Michele Bachmann Newsweek Cover Make Her ‘Look Crazy’? Their hearts are in the right place, but is Newsbusters really helping Bachmann out by starting a national debate about how crazy she looks? Newsbusters‘ headline might make you think they’re just being oversensitive, but once you get a load of Newsweek‘s cover, it’s immediately apparent that they have a point. Newsweek subscribers, upon receiving this issue, will probably scratch their heads trying to remember when they signed up for a trial subscription to It Puts The Lotion In The Basket Weekly. Is Sheppard conceding the point that Michele Bachmann is “The Queen Of Rage,” as the Newsweek cover giant-fontedly dubs her? If not, it’s a pretty glaring omission. Sheppard also neglects to mention any of the previous Newsweek cover “controversies,” a deviation from Newsbusters’ normally exhaustive M.O. A cynic might wonder if the real point of this item was, in fact, to start a national debate about how crazy Michele Bachmann looks. In a Republican presidential field that’s weaker than Charles Atlas beginners class, Bachmann’s ability to connect with the energized Tea Party base has made her a danger to the likes of Mitt Romney (R-MA) and Tim Pawlenty (R-UhRoh). Republicans have come out of the woodwork to attack Bachmann over her migraines. A debate over her “crazy eyes” fits in well with a strategy to discredit a candidate who is a very real threat to the GOP establishment. For what it’s worth, the Newsweek photo certainly doesn’t seem designed to flatter Bachmann, and is strongly evocative of her post-SOTU address to the faerie on the cameraman’s shoulder, but it’s probably intended to pair with that “Queen Of Rage” headline. It’s tough to see how anyone could have a problem with one, and not the other.